by Mark Tre' - "The Cruise Examiner"
This week's story is all about Down Under, especially with the recent visits by David Dingle and Peter Shanks of Carnival UK and the announcement from Royal Caribbean that it would double its presence there next year. We also note the possible demise of easyCruise and have a look at how the German market is developing. As the world cruises all pass by Sydney in February, cruise line executives have the habit of escaping the northern winter and visiting Sydney for various events and announcements. This year was no exception, and while Carnival brands P&O Cruises, P&O Australia, Princess, Cunard and even Seabourn remain to the fore, Royal Caribbean has just announced that it is about to double its presence down under. To begin with, David Dingle, ceo of Carnival UK (which includes Australia in its portfolio), visited down under late last month and revealed that twelve ships from Carnival brands P&O Australia, P&O Cruises, Princess Cruises, Cunard Line and Yachts of Seabourn would visit Australia this year. Half of these ships would be based there. He also revealed that Carnival Australia would book 190,000 passengers this year and then went on to predict that that figure would rise to 300,000 in 2010-11 and 350,000 in 2011-12, a massive increase of almost 85% over two years. Part of this growth will come from P&O Australia, which has added the Pacific Jewel and will soon see the addition of the Pacific Pearl when she transfers in to the down under fleet. Both ships are moving to Australia from the Ocean Village brand, which is being closed down. Dingle's visit was followed last week by Peter Shanks, president and managing director of Cunard Line, who revealed that Australia and Germany are Cunard's fastest-growing markets, and that Cunard will probably attract 10,000 cruisers from Australia this year, up 25% on last year. Not bad for a line whose ships only call on Australia once a year on world cruises. Shanks sailed from Sydney on Saturday on the Queen Victoria, on board of which he will host a dinner for the ship's full round the world cruisers. Princess Cruises operate two Australian-based ships now in the 1,950-berth Sun Princess and Dawn Princess, which latter will leave Sydney on a world cruise for the Australian market on May 21 for the Mediterranean (with a special call at Gallipoli, where 8,141 Australians gave their lives in the First World War), the UK and Ireland, the United States, Panama, Mexico, Hawaii and the Pacific Islands before arriving home again on September 3. However, more interesting news came from Gavin Smith, managing director of Royal Caribbean Cruises Australia, who last Thursday announced that in November 2011, Royal Caribbean will send its 2,112-berth Brilliance of the Seas to join the 2,000-berth Rhapsody of the Seas in Australia. 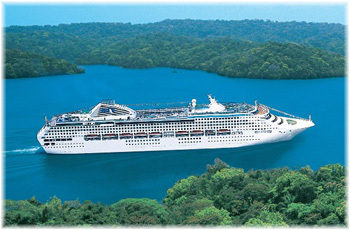 He further commented that Royal Caribbean is considering basing a ship year-round in Australia starting in 2012. This still leaves them a long way behind Carnival Australia but there has to be room in that market for more than just one cruising group, especially as Smith admited that most of Royal Caribbean's business in Australia presently comes from abroad. The Radiance of the seas will become the newest and largest ship to be based at Sydney. Royal Caribbean Cruises has been chasing P&O in the UK market for several years now and has its 3,600-berth Independence of the Seas based in Southampton, to be joined this year by Celebrity Cruises' 2,850-berth Celebrity Eclipse. In the UK, the two lines have developed a very strong local following and with the addition of some Vegemite and Fosters beer, there should be no reason they couldn't do the same in Australia. Unfortunately, however, the last time it tried to sell Celebrity in the Australian market, it ended up cancelling the program (and sthere is still no word on whether Celebrity might try again once all their new ships are delivered). The false start by Celebrity might remind one of NCL, who also tried the Australian market with Norwegian Capricorn Line in 1997. But when Star Cruises took over NCL in 2001, the line was dissolved. It should be noted that while New Zealand looks strong, its cruise market is made up mostly of foreigners. But however one might measure the Australian market, if it were developed to the same level as the UK and Canada it would be producing well in excess of 500,000 cruisers a year instead of the present 330,000. That would indicate that Mr Dingle is probably quite right when he predicts such huge growth for Carnival Australia, even when one realizes that he is predicting that his company alone will handle as many cruisers as the entire Australian market now produces for all lines. Meanwhile, in Perth, Classic International Cruises has been operating Fremantle-based cruises since 2003. It now uses the 560-berth Athena, and in 2010-11 will add the 450-berth Princess Danae, working out of Singapore, for the Australian fly/cruise market. Meanwhile, Carnival Australia will also be sending their 1,485-berth Pacific Sun and Sun Princess out to Fremantle to compete with them in the Western Australian market. And while Australia hasn't seen any Italian ships since the days of Sitmar Cruises' Fairstar and Fair Princess, the 2,260-berth Costa Deliziosa wll be calling there on her 2011 maiden world cruise, adding a bit of a European taste to the product on offer there. Bottom line to all this is when Australia might see its first cruise newbuilding. As David Dingle once pointed out, Ocean Village was the sort of brand that could only support second-hand ships. But will these same ships in the Australian market be able to produce strong enough support to make it feasible to build a new ship dedicated specifically to Australian cruising? Is last week's news the end of the line for easyCruise or are they just taking a year out? In August last year, after four years of rather inconsistent operations, Stelios Haji-Iouannou finally sold the rights to the use of the easyCruise name to Greek ferry operator Hellenic Seaways. From starting off as a boiled down "no frills" cabin price only product on the Riviera it had evolved into a pretty standard budget Greek Island cruise operator, running 3- and 4-day cruises from Piraeus, by the time this sale took place. In return, Stelios obtained some interest in Hellenic Seaways. The news broke last week, however, only six months after the Hellenic Seaways agreement, that easyCruise was putting its 2010 itineraries "on hold" and could not confirm any availability until it heard further from its new owners. 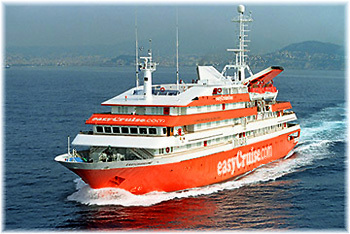 EasyCruise has has difficulties from its start in 2005. The 232-berth easyCruise 1 proved to be too small to be viable and had to be replaced by the 462-berth easyLife in 2008. The startup line's first venture into river cruising, the easyCruise 2 of 2006, had also closed down midway through its 2007 season. In a related move, the original sister ship of the EasyCruise 1 (both were former Renaissance ships), the 100-berth Clelia II, and named for Stelios' sister Clelia, has been chartered for ten years to Ausralia's Orion Cruises and is to join them in the summer of 2011 as Orion II. As Clelia II, she opened a Great Lakes cruise service for Travel Dynamics of New York in 2009 and will still return for one more Great Lakes season this year. News is not all bad for the Great Lakes, however, as Pearl Seas Cruises' 210-berth Pearl Mist will be cruising the Great Lakes this year and Hapag-Lloyd Cruises' 420-berth Columbus will be returning in 2011. But in the end, getting back to easyCruise, it seems "no frills" cruise lines are not such a great idea after all. Most people really do want the frills (and the thrills). Not only easyCruise, but Airtours' Sun Cruises and the imminent demise of Ocean Village tend to point in this direction. There are two or three exceptions of course. Thomson maintains Island Cruises as a separate one-ship brand. And Louis Cruises and Classic International Cruises still manage to carve out a niche for themselves among those who want a low-fare product. But the latter were never introduced as no frills products. Peter Shanks' comment that Germany was one of Cunard's two fastest-growing markets does not come as a complete surprise. Going all the way back to Norwegian American Cruises, which Cunard acquired in 1988, it has had a large German following. At first they stayed with the Vistafjord, which had typically been about half full of Germans as she was based in Europe, where the Sagafjord was their American ship. Even after the Vistafjord became Cunard's Caronia she retained her strong German following and whenever the Queen Mary 2 calls on Hamburg she brings throngs out tro see her. Today that German following has successfully been transferred to the new Queens and there was a very large number of German passengers on Queen Victoria's Transatlantic crossing to New York last month.. In the meantime, the "club cruise" ships of Aida Cruises have built up such a large following that there are now seven of them, ranging 1,185 to 2,050 berths, with two more on order. Aida is such a new name in the business that most people forget that it actually dates back to the 1960s as Deutsche Seerederi (DSR). Its first ship, the Volkerfreundschaft, is still sailing today as Classic International's much-rebuilt Athena. 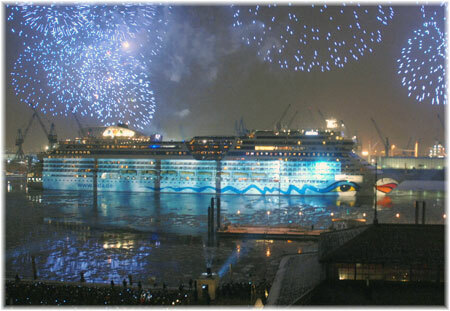 All but the original Aida, built in 1996 and now named AidaCara, were built in Germany, four by Meyer Werft and two by Aker MTW. Today Aida is operated as the German division of Costa Cruises and its ships are all all registered in Genoa. Nevertheless, it is dedicated to the German-speaking market, so much so that one can even forget sometimes that Aida and Cunard share the same ownership. The latest product on the German market, TUI Cruises' 1,870-berth Mein Schiff, is a joint venture between Royal Caribbean Cruise Lines and TUI Travel, who also operate the upmarket Hapag-Lloyd Cruises. In the three months to December 2009, TUI Cruises, which began operations in May 2009, generated 122,000 passenger days, for a load factor of 69%. The upmarket Hapag-Lloyd Cruises produced 77,000 passenger days on its four ships, a 77% load factor. Lower bookings reported in both markets reflected the economic conditions of the period in question. TUI Cruises will celebrate its first anniversary this year with a 12-night Round Britain cruise from Hamburg on May 9-21, with fares from €1,695 per person. Meanwhile, Phoenix Reisen of Bonn have continued to expand until they now have four ocean ships, the 600-berth Amadea and 885-berth Albatros and the chartered Athena and 450-berth Alexander von Humboldt. They are due to take delivery in 2011 of the 1,200-berth Artania, built as the first Royal Princess and trading today as P&O's Artemis. Then there is Hansa Kreutzfahrten of Bremen, with its 400-berth Delphin, 650-berth Delphin Voyager and the chartered 450-berth Princess Danae. Other operators in the German market include three single-ship lines, Peter Deilmann Cruises of Neustadt, with its 550-berth Deutschland, Lord Nelson Seereisen, with its 780-berth Mona Lisa, now in British Columbia for the Winter Olympics, and Transocean Cruises of Bremen with its 590-berth Astor, not to mention numerous river operators.